Watching video clips of real visitors using your website can provide really powerful insights about things you need to change to get vastly better results.? You may decide to change the menu layout, move sections around or apply other similar changes and see your response rate soar. You can either invest in expensive eye-tracking studies or use a simple solution that we can install for you. Viewing a few such videos will give you enough ideas for identifying what problems do the people face while using your site. Are they able to locate the required information? Can they easily post a lead or order your products? Rectify the mistakes, provide additional information if required or make other improvements and then see the response rate go up. 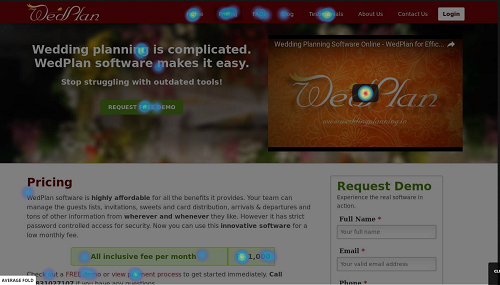 You also get heat maps of your key pages to identify where do the people click. A typical mistake web designers make is to not have a link on prominent images which people click trying to go somewhere or to get more information. Once you setup these links, the visitors get what they want, stay longer and thereby improve your results. The tool is free to try for a few days, enough to generate several meaningful insights. It also offers a FREE basic version which will be quite useful for most small websites. The paid version is also very affordable at around $29 per month and you can use this if you get medium traffic to your site. We also charge a fee ranging from Rs 2,000 to Rs 10,000 depending on the size and structure of your site. However, let me assure that this investment can be recovered within a few days. You get more leads and more sales and the improved site will continue to generate more income for you for a long time to come. Does Your Web site Have Empathy for Customer Issues? Why did your prospect land up on your web site? To buy something from you? Not really. He is there because he needs help solving one of HIS problems and he thinks – you might be able to help. Your web site should show empathy towards his problem and offer advice and solutions that help him solve this problem. We understand that when you visit our website, you want to grow your business and get new leads. So we advise you on ways to improve your marketing with various tools – including a a well designed web site. Similarly, if you sell a software for retailers, your web site should focus on helping these retailers increase the sales at their stores. It is ok to remind them that your software can help them increase their store’s efficiency and their bottomline in the process. But the focus of the site should be these prospects.